Lightroom makes it easy to create and work with more than one catalogue, which makes some people think that is how they should work. That couldn’t be further from the truth. I originally wrote this post back in 2007. But the question of running more than one catalogue keeps popping up in blog posts or in user forums, and I’ve been asked about it on too many occasions to mention. The answer is still the same – don’t break up control of your picture collection in such a way. 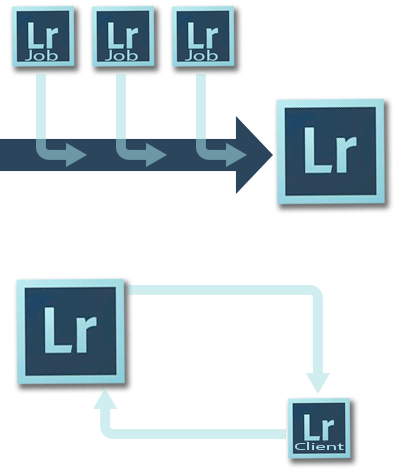 Another way to think of Lightroom is as a centralized inventory system managing a warehouse… as your business grows and you rent the neighbouring warehouses too, you still only need one system to keep control of your work. I accept that at times we often need temporary catalogues for a variety of reasons, travel for example, or handing over a project to someone else. This article isn’t about those workflows. Here I am talking only about how you control your photographic collection and workflow as a whole. Those who advocate splitting their catalogues will often tell you catalogues get slower when they contain a certain number of images. It was 10000 or 20000 in the early days, then 50000, or 100000 was suggested. Isn’t it a little odd that these numbers rarely coincide, and are always nice round figures? It’s not a surprise though – because the numbers are little more than voodoo, just big numbers chosen out of a hat. Frankly, as someone who in his previous life has a lot more database experience (enterprise-level SQL Server and Oracle) than most photographers, these numbers are not big, and Lightroom’s underlying database, SQLLite, is not going to struggle with tens of thousands. Adobe provide no official guidelines for when a Lightroom catalogue might contain “too many” images and is likely to run up against operational limits. My own biggest test catalogue contains 105000 images and ran OK on a 6 year old PC, while I work with a photographer whose 700,000 image catalogue was also not on the latest hardware. In 2013 Adobe even mentioned one user had 1.9 million photos in a catalogue. Lightroom slowdowns are almost always unrelated to the number of pictures in the catalogue. Remember that this is a program that covers raw image processing and DAM, so it strains many aspects of your computer and its peripherals. Any one of these is more likely to degrade a system’s performance – for example, a graphics driver problem or speed of accessing storage devices, the size of the raw file being processed etc. In other words, you don’t gain anything and Lightroom won’t be any faster if you do split things up into smaller catalogues. Catalogue size does make backup slower, and is slower performing integrity checks or optimisation. But you don’t do those tasks in valuable time – you leave them running when you knock off for the day. What are the problems caused by multiple catalogues? I tend to describe using multiple catalogues with term like “fragmenting” or “breaking up control of your workflow”. Both expressions are deliberately pejorative, of course, but they do describe very accurately what you are contemplating. The most obvious impact on your workflow will be that you won’t be able to search for pictures as readily as you can with a single catalogue. If you don’t find a picture in catalogue A, you’re going to have to open catalogue B, and so on. And what happens when you want pictures that are in different catalogues such as when you’re pulling together a slideshow of your best pictures? A multi-catalogue organization may be manageable if your search needs are very limited indeed, but it’s not a very time-effective way to work. Another practical difficulty is inconsistency between catalogues. You often find, for example, that keywords will be spelled differently, with the singular used in one catalogue or the plural in another. Or consider what happens when you import the same image into more than one catalogue – which one contains the correct adjustments or metadata? Multiply this by a few thousand pictures are you’re going to struggle to remember, aren’t you? But while searching and metadata consistency are annoying and inefficient, the bigger risk is to the physical safekeeping of your work. When some images are supposed to go into catalogue A, others into catalogue B, and so on, something is bound to go wrong. One day you’ll import pictures into the “wrong” catalogue, or you’ll import them into more than one catalogue, or some pictures will slip through the cracks and not be recorded in any catalogue. There can be good reasons for (temporarily) breaking up control of your workflow…. In practice, sometimes you do need to take a less dogmatic line. Maybe work on jobs in separate catalogues, then import them into your main one when they’re finished. You may not want to risk your employer seeing your personal work, or another strong reason might be if you shot pictures you really don’t want the kids to see. Both may be perfectly good reasons for maintaining two or more main catalogues. Weddings are a classic case for keeping a series of catalogues, which makes a lot of sense when you imagine the catastrophic business impact of mixing photos from different events. Often the catalogue is archived in the same folder as the original images, meaning it’s always possible to do exact reprints. But again, here it’s important to remember the distinction between temporary catalogues for certain projects, and the main catalogue that records all your pictures. After a wedding shoot is delivered and the job is closed, import the wedding catalogue into your main one. A similar reason is when you don’t want client A to see client B’s pictures. Again, there’s a strong underlying business logic, but that doesn’t mean you need to keep your main catalogue divided in this way. Instead, only when you are actually going in front of clients do you generate a temporary catalogue with File > Export as Catalog to create a catalogue specific to the client> After the meeting you can use File > Import from Catalog to bring any edits back into the master catalogue. In a way, the key is to allow for the different ways we interpret and categorize pictures. These often overlap – is it a personal nature picture or is it client work? – and our interpretations change over time and in different circumstances. Keywords have that kind of flexibility, so they are where you put your effort – not into folder structures or separate catalogues.